Here's a little bit of inspiration that evolved out of Thanksgiving at my brother's house. 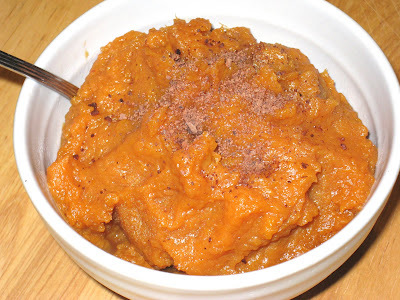 We cooked up some sweet potatoes and then mashed them. No one could think of anything exciting to do with them, so I squeezed the juice out of a tangerine, added a little olive oil, mixed it with the potatoes and called it a day. If I had been at home I would have added dried cranberries and walnuts and baked it again for this tasty side dish, but there were already enough things going on in the kitchen (and in the oven) that I decided it would not be a good idea to even suggest getting that fancy. So we served the potatoes with the orange juice and olive oil. And those of us who like sweet potatoes served ourselves up some, and those of us who didn't chose not to have any. Which meant there was a lot left over. Having made them, I made it my responsibility to help finish them off. Which I was happy to do, because I really like sweet potatoes. But I have to admit they were awfully boring. My brother had also bought some store-made dips and crackers, kind of a last-minute appetizer decision made the day before the holiday (when you start to worry that you won't have enough food, or about what everyone will do while waiting for the turkey to finish cooking). People nibbled on them occasionally, but no one made much of a dent in the spinach, ranch, or raspberry chipotle ranch dips. So we had those leftovers to eat up as well. The day after Thanksgiving I put some of the raspberry chipotle ranch dip on my plate next to the sweet potatoes and it spread, causing a "you got your raspberry chipotle ranch dip on my sweet potatoes/you got your sweet potatoes on my raspberry chipotle ranch dip" situation. I scooped the mixture up with my fork and put it in my mouth. My tastebuds went wild. "Whoah!" they cried. "What's that? We like it - sweet and spicy and creamy. Give us more!" Which I did. And I had no trouble disposing of the rest of the sweet potatoes over the course of the next few days. I resolved to experiment when I got home. For one thing, I really didn't want to have to rely on a store-bought, processed dip when I was pretty sure I could recreate the flavors better on my own. The ranch part of it seemed the least interesting to me anyway, so I decided to focus on the raspberry and chipotle. And came up with a delicious new flavor combination for mashed sweet potatoes. I can't wait to serve them up for Christmas. Wash sweet potatoes, pierce with a fork, and bake in 350 deg. F. oven for 40-50 minutes, until soft to the touch. Let cool slightly, peel, and place in large mixing bowl. Mash the potatoes. Add olive oil, chipotle, raspberry syrup, salt and pepper. Adjust seasonings to taste. *For raspberry syrup: Place 10-oz. bag of frozen (or fresh) raspberries in a 3-quart saucepan with 1/4 cup water and 1/4 cup sugar. Bring to a boil, lower heat and simmer for about 30 minutes, until liquid is reduced by half and fruit has broken down. Turn off heat and let cool, then strain through a cheesecloth.